The other week, five students from all over the world gathered at my studio to dip their toes in the waters of cologne and experience what studying perfumery is all about. The Citrus & Colognes Week is the ideal course to start studying perfumery. You get to work with really simple, fun materials that are familiar (mostly citrus and herbs, but also some basic woods, spices and floral notes such as sandalwood, cedarwood, rose and neroli). Students learn all the nitty-gritty details of lab etiquette, how to handle the materials, dilute, measure and tincture them, etc. We also unveiled the mystery of aromatic extractions: how essential oils are distilled, how absolutes and other extracts are extracted, etc. and how to make your own macerations and tinctured. 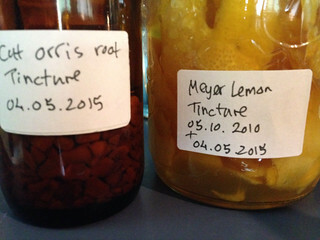 In particular, we learned how to tincture citrus zest (Meyer lemon... mmm...), and leaves (i.e. : Kaffir lime leaves); as well as dried orris roots (which turned out beautifully although they still need a little more maturing). On the technical trouble shooting frontier, we learned how to added distilled water or hydrosols to create true eaux de colognes and eaux de toilettes and understand the technical difficulties that arise from this. 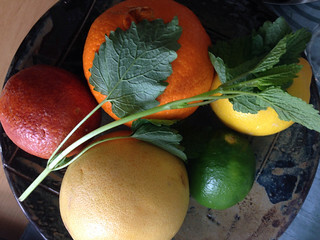 We also learned about the chemistry of citrus oils, and how their unique characteristics makes them popular not only as a flavour but also as an active ingredient in many cleaning products such as soaps, solvents and detergents. Last but not least: We've created historic formulae of eaux de colognes from given tried-and-true formulae from my new book; as well old historic recipes from various historic books in my library. Students also learned how to analyze classic and commercial citrus and cologne-type fragrances, and try to pick out the notes and re-create the scent based on the smell alone. On the last day, we also attempted at creating our own original citrus perfumes without any given starting point of a formulae, but rather drawing on a personal inspiration that emerged from an exercise we did together in class. The next course will take place in September: Fougere Week (September 21-25). It is suitable for beginners. Ideally, you should have read Ayala's book "Foundation of Natural Perfumery" and taken the Citrus & Colognes and/or Lab 101 course prior to that. If this is your first time applying for the program, email ayala (at) ayalamoriel.com with your CV and a coverletter explaining why you'd like to study this program. Suitable candidates will be contacted to schedule an interview in person or via Skype.